Training is offered on a wide range of industrial lift trucks. We will give your staff tuition on counter balance, reach and pedestrian pallet trucks as an example. Training can be provided on site and in a safe, relaxed and informal environment. 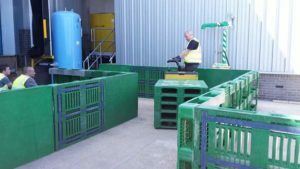 Our training covers induction, health and safety, the 1974 Health and Safety at Work Act, pre-use checks, as set by the LOLER and PUWER regulations of 1998. And it also covers the theory test and the practical operator test. Counter Balanced B1/Reach Truck D1 up to a lifting weight of 5000 kilograms. 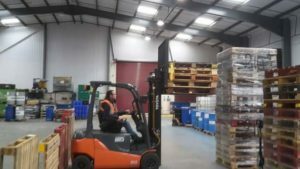 These courses are based on counter balanced and reach truck (B1/D1 categories) and are set up to comply with the recommendations and standards of the HSC, Approved code of practice, Supplementary Guidance. “Rider Operated Lift Trucks – Operator Training” and Accrediting Bodies (ITSSAR). ITSSAR is a founder member of the ABA Workplace Transport 2012 accreditation scheme. This training conforms to the requirements of the Approved Code of Practice and Supplementary Guidance Rider Operator Lift Trucks – Operator Training L117. For other types & classifications of trucks please contact us for more information regarding length of courses, the maximum amount is 3 trainees per course as laid out by the accrediting bodies. Where are the courses carried out? The courses can be carried out either at our training centre in London, Essex and Sussex, or on your own premises.